Born in Nairobi, Kenya, Kulvinder Ghir began as a stand up comic, performing in clubs around the north-east of England. In 1985 he made his first appearance on television as a regular cast member in Howards' Way (1985-87). In 1986 he appeared in Rita, Sue and Bob Too (d. Alan Clarke) and starred in the BBC Screen Two drama Lucky Sunil (tx. 17/4/1988). In 1991 he wrote his first short, Breath of Life (d. Navin Thappar). During the 1990s, Ghir 's career developed steadily, with regular roles in Waterfront Beat (BBC, 1990-91), The Real McCoy (BBC, 1991-94) and At Home With the Braithwaites (ITV, 2000-) although he is better known for his comedy roles in Goodness Gracious Me (BBC, 1998-2000). Other film credits include Brothers in Trouble (d. Udayan Prasad, 1995), Flight (d. Alex Pillai, 1998) and Bend it Like Beckham (d. Gurinder Chadha, 2002). 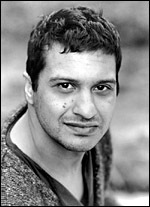 2003 marked his return to theatre, making his RSC debut in an adaptation of Salman Rushdie 's novel Midnight's Children.